A video called “Web 2.0 … The Machine is Us/ing Us” is an engaging and enjoyable 4.5 minute non-verbal documentary taking us from ‘pencil’ to ‘Web 2.0′. It adds context to the advances that got us here, and suggests what might yet be in store. At about 03:40, highlights from an August 2005 Wired article, “We Are the Web,” are used to suggest that we are “teaching the machine.” I’m afraid that that notion is still inadequately understood and appreciated. Perhaps the so-called “social web” isn’t about connecting people (not about helping people socialize), but about information conservation: If a person chooses to do something — no matter how small — it’s inherently interesting, precious, and valuable. We’ve barely started to figure out what to do with this second-generation information. Where we have it’s been exciting, useful, and successful: Flickr’s Interestingness and Clusters, the notion of “watching” on Upcoming, the newer “people who looked at this ultimately bought that” in Amazon, and of course Google’s PageRank. The idea isn’t new, but it’s still under appreciated. And who will write the software that makes this contraption useful and productive? We will. In fact, we’re already doing it, each of us, every day. When we post and then tag pictures on the community photo album Flickr, we are teaching the Machine to give names to images. The thickening links between caption and picture form a neural net that can learn. Think of the 100 billion times per day humans click on a Web page as a way of teaching the Machine what we think is important. Each time we forge a link between words, we teach it an idea. Wikipedia encourages its citizen authors to link each fact in an article to a reference citation. Over time, a Wikipedia article becomes totally underlined in blue as ideas are cross-referenced. That massive cross-referencing is how brains think and remember. It is how neural nets answer questions. It is how our global skin of neurons will adapt autonomously and acquire a higher level of knowledge. If you’re in the Bay Area and interested in Web browsers, make plans to come watch Douglas Crockford moderate a panel, Browser Wars: Episode II The Attack of the DOMs, between the Big Four browser vendors. Håkon Wium Lie (CTO of Opera) and Chris Wilson (Mr IE himself) are already confirmed, and I expect the other two to send big guns too. It should be a unique and exciting discussion, to say the least. I expect Crockford to be an excellent moderator – I always enjoy his wit, and he definitely knows his stuff. If you want to see him in action in advance, and learn a ton about the DOM in the process, watch his three-part 78 minute presentation called “An Inconvenient API: The Theory of the Dom” hosted on our YUI Blog. Interesting new this morning: Second Life (Viewer) in now an open source project. Though I’m not active in Second Life, I’m intrigued and think this development says good things about its future. Very interesting. They only open-sourced the Viewer, but in many ways — almost by definition — they world/environment is already open-source. I guess the laws of physics for SL are not yet open, but that doesn’t bother me. Releasing the source now is our next invitation to the world to help build this global space for communication, business, and entertainment. … [W]e welcome the inevitable with open arms. In Amusing, Cool, Culture, Current Events, Design, Engineering, Events, Life..., San Francisco, Social Web, Tools, Travel, Web Services, Yahoo! I know, I know, you LOVE to go to work/school on a Friday. It’s your favorite day of the week and there’s nowhere you’d rather be than in your office/cube/classroom. That’s cool — I don’t judge — but, but, but next Friday (Sept 29th) you realllly should play hooky and sneak down to Yahoo for our first every public Hack Day and Developer Day. It’s gonna be quite the event, and I wouldn’t want you to miss it. Really, you should come. Sold? Cool: learn more and request an invitation. But that’s not even the cool stuff! The entertainment lined up for Friday night is going to be incredible, although a non disclosure agreement prohibits us from saying who it is. I can say with confidence, though, that everyone attending the event will be very, very happy they were there for Friday night’s party. Then the REAL fun starts: 24 hour hackathon. 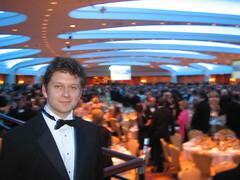 My brother Peter, who works for The Onion attended the Press Club dinner at the White House earlier this year.